No, no, not savings bonds. But interest gathered? Oh yeah. There sure should be. You see, the kinds of bonds we’re interested in as genealogists are the ones that help us track down our ancestors, understand their lives, and figure out relationships. From marriage bonds to officials’ bonds, sureties given in a wide variety of circumstances can offer clues to our family members and their friends, associates and neighbors. So, as we trace our families, we need to learn what they are, how to find them, and how to use them in building our family’s FAN club. 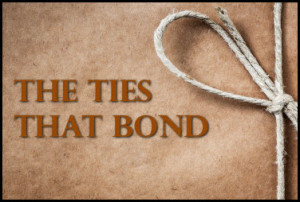 Come on along tomorrow, Wednesday, February 19th, for The Ties That Bond, a free webinar sponsored by Legacy Family Tree. We’ll talk about bonds — all kinds of bonds — and how we can use them in our research. As always, you need to register in advance if you want to participate in the webinar live (it’s at 2 p.m. EST, 1 p.m. CST, noon MST and 11 a.m. PST). But if you can’t clear your calendar for that day and time, remember that Legacy Family Tree webinars are available, free, for seven days after each webinar, and then available for purchase (individually or as a subscription package) so you can review the information more slowly, in more depth, at your own pace. Thanks Judy for an exceptional webinar! Thanks so much for the kind words, Cynthia! It’s a fun topic. Enjoyed your Webinar. Always something new to learn. You mentioned that anytime there was liquor involved there was a license & where there was a license there was a bond. My great granduncles, Michael & Joseph Seymour operated a café on Main Street in Orange in Essex County, NJ during the 1890 to 1910 time period. Their primary source of income was likely from the liquor they sold. Am interested in checking Essex County ordinary license bonds to see if there is a record of their business. Can you help? The word “ordinary” wouldn’t have been used for a tavern in New Jersey, John. I’d look for tavern or liquor license bonds instead as a name. Some records from that late are in the NJ State Archives (see here for example with the first item on that page being petitions for tavern licenses through 1891). Later records are probably still at the Essex County Courthouse.